According to Sally Fallon of the Weston A. 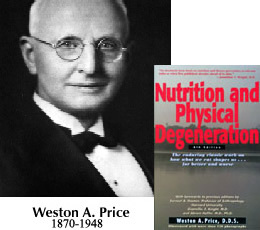 Price Foundation, "Dr. Weston A. Price, a Cleveland dentist, has been called the "Charles Darwin of Nutrition." 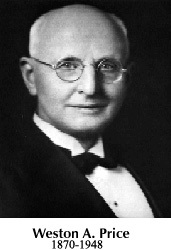 In his search for the causes of dental decay and physical degeneration that he observed in his dental practice, he turned from test tubes and microscopes to unstudied evidence among human beings. Dr. Price sought the factors responsible for fine teeth among the people who had them- the isolated "primitives." The world became his laboratory. As he traveled, his findings led him to the belief that dental caries and deformed dental arches resulting in crowded, crooked teeth and unattractive appearance were merely a sign of physical degeneration, resulting from what he had suspected-nutritional deficiencies. There are now less than a million people in the U.S. that claim their primary occupation to be farming. This represents a loss of almost 5 million farms since 1935. Family farms, exhibiting self-sufficiency, are the foundation of our rural communities. Communities benefit from the local farmers as they purchase their goods from local merchants and provide jobs which enhance the local economy. Be sure to ask a lot of questions. Just because a farmer is local doesn't guarantee that he has not used pesticides or herbicides in the production of his product. Ask direct questions and insist on what you want.